Here’s a hacky #GTMTips tip for you. Have you ever had a Google Tag Manager container, where you’ve been updating your Google Analytics tags over the years? And perhaps these tags (and, today, Google Analytics Settings variables) have been updated with an ever-expanding list of Custom Dimensions? 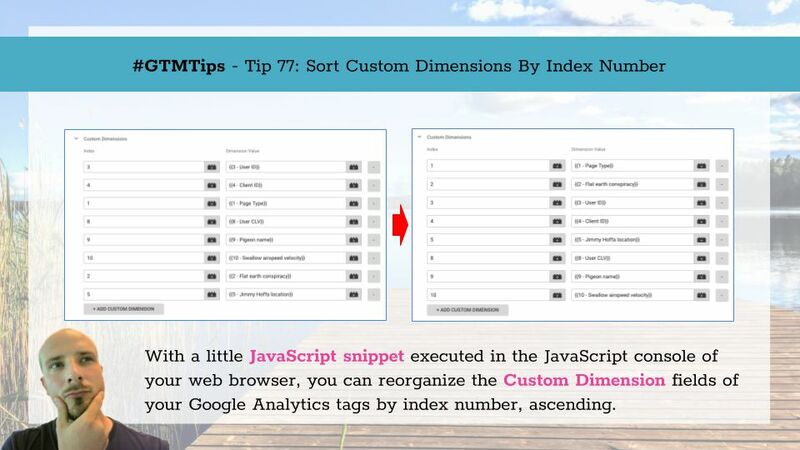 And perhaps this list of Custom Dimensions is sorted willy-nilly, because once you have 50+ rows, it just doesn’t seem like a fun thing to do to go over each row and update them so that they are sorted by Custom Dimension index?